This fall, Penn State Berks welcomed 104 international students to the campus community. Of that number, 40 are new students. To help these students succeed, the college has implemented a variety of programs and events. According to Sharon Pitterson-Ogaldez, coordinator of diversity and international programs, the largest area represented by our international students is Asia, including the countries of China, South Korea, and India. This year, Penn State Berks also has international students from Egypt, England, Federated States of Micronesia, Germany, Hong Kong, Mongolia, Nigeria, Russia, Taiwan, and Vietnam. Kaiyuan “Kevin” Xu is originally from Shanghai, China. He came to the U.S. five years ago as a high school student and he lived with a host family in California. Both of his guardians were high school teachers specializing in English and math. After graduation, Xu decided to follow in his father’s footsteps and pursue a degree in civil engineering at San Jose State University, part of the California State University system. After the first year, he realized that his interests were geared more toward mechanical engineering. It was a love of Marvel Studios that brought Zirui “Rinna” Wang to the U.S. from the City of Wuhan in southeastern China. She explained that her dream job is to work in Marvel Studios’ marketing department. She came to the U.S. a year ago as an exchange student and lived in Atlanta. While she enjoyed the area, she was attracted to Pennsylvania, citing her love of football. Her ultimate goal is to graduate from Penn State, get some experience in marketing, and then return to China to work for Marvel Studios. International students begin their time on campus with the International Student Orientation program, which covers a wide variety of topics, including the legal issues that students must deal with for immigration and government rules and regulations. International students meet and connect with their international mentors, as well as college faculty and staff members. Ilya Ignatenko, a first-year student planning to major in electro-mechanical engineering technology, is originally from the City of Ufa, which is located 1,000 miles east of Moscow. Two years ago he moved to the U.S. to live with his mother who moved here 10 years ago when she remarried. At that time, Ignatenko chose to remain with his father in Russia to play ice hockey. Jheng “Jacky” Yan Lin arrived in the U.S. only three days before International Student Orientation from his native Taiwan. He plans to begin his studies at Berks, and complete his major in Finance at University Park. Yan Lin goes on to explain that he wanted to leave his comfort zone and learn about a different culture. His parents were hesitant at first but they were proud that he wanted to challenge himself. He also feels a responsibility to educate his fellow students about the Taiwanese culture. 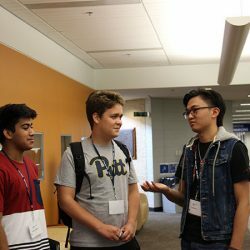 The Penn State Berks Intercultural Office organizes several events throughout the academic year that allow international students to interact with other international students from other Penn State campuses, as well as local events where international students can meet and interact with domestic students. Upcoming events include a Welcome Barbeque that will bring together international and domestic students on August 31; an exploration of Pennsylvania Dutch Culture on September 7; a Unity Day celebration where the entire campus community celebrates diversity on Sept. 19; and a trip Philadelphia with international students from regional Penn State campus on September 22.In addition, Penn State Berks has several clubs that celebrate cultural diversity including the Black Student Union; Chinese Culture Club; INK (International Klub); Latino Unity Club; Muslim Students’ Association, and the Punjabi Culture Club.